The 2009 Spring Colorado USA Wildwater Camp will be held west of Vail on the Colorado River/Glenwood Canyon Saturday, April 18-19th with lead instructors Mike Freeburn and Andy Corra as well as several other past and current national team members. This camp is a must attend for the serious wildwater, sea kayak, or adventure racing paddler. Intermediate and advanced skill levels will be the focus of this camp; however swiftwater beginners are welcome on Saturday for flatwater clinic. Saturday will be held on Class 1+ sections and will have flatwater focus while Sunday will be held on class 2-3- sections for a swiftwater focus. This clinic will be held on the same course as the Junior National Team Trials the following weekend. Email dennyadams@aol.com to register (include name, cell phone number, skill level intermediate or advanced, and hometown). Entry for USACK members is $25 and is $45 for USACK non-members payable at event (card required). Youth financial hardship waivers are available upon request. 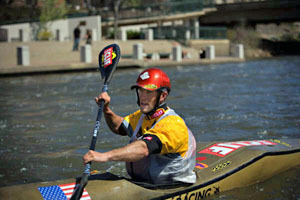 To join USACK go to www.usack.org and specify "wildwater" as membership type. Fee covers instruction, safety kayakers, video analysis, liability coverage, and shuttle staff. Minors must be accompanied by parent or guardian via club sponsor. Attendence is limited to 25 so early enrollment is recommended. A limited number of plastic K1, C1, and C2 wildwater boats and skirts will be available with advance email notice. Paddles, pfd, helmet, footwear, flotation bags, and appropriate clothing are required. Sea kayaks are welcome on day 1 flatwater only as day 2 would be challenging for anything but wildwater kayaks. Group food and housing Saturday night is being negotiated and will likely be a separate nominal fee or included. A course flyer, objectives, and final information will be emailed to you prior to camp weekend. Parking is very limited so car pooling is strongly encouraged.